In response to the roar of fireworks, the giant two-headed demon wolf emerges from the moonlit lake, shimmering water streaming from his slavering jaws, and plunges into the milling crowd. All over the three continents of Azeroth – in Horde and Alliance cities and villages, in sandy deserts, deep forests, snow covered mountains and enemy filled dungeons – Elders give wise sayings and ancient coins to all who brave various dangers to pay their respects. And little red envelopes begin to clutter up the mail box. In 2010 the Love in the Air had barely started (and has just now abruptly ended) when the Lunar Festival arrived with a bang. (In 2011, the order is reversed with the Love in the Air festival following the Lunar Festival.) And it’s clear that this seasonal event, unlike the Valentine’s event of 2010, has not had a radical makeover with roughly the same activities, quests, achievements and rewards as in previous years. EDIT There are it seems minimal changes to the festival in 2011 – with some changes of location of the Elders to adjust for the changed topography following the Sundering. For example, in the Eastern Kingdomss the Stormwind Elder with the Lunar Harbinger, Fireworks vendor and launchers, have been moved to just outside the gates of Stormwind from the destroyed park area (despite what the quest locator might indicate.) In Kalimdor, the Orgrimmar Elder is now on the roof area near the flightpoint rather than in the Valleyof Wisdom next to where Thrall’s Hall used to be, theTaurajo Camp elder has moved a little north to Vendetta Point, the Elder of Auberdine can now be found on the southern outskirts of Lor’danel. For changes in 2012 check Newly Remembered Elders of the Cataclsym . In the Lunar Festival the druids of Nighthaven Moonglade celebrate the ancient defeat of the Burning Legion. The festival revolves around fireworks, lunar festive finery, ancestral coins and elders – lots and lots of elders – in fact 75 of them in total. 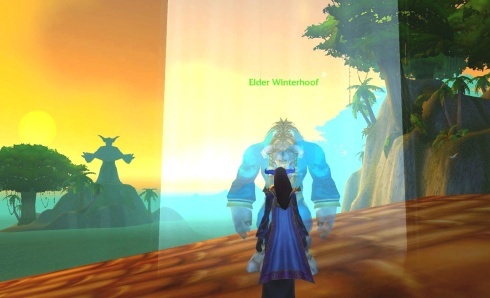 The elders are ancient heroes of Azeroth – generally night elf, tauren or dwarven – who serenely stand bathed in a column of moonlight in the most unlikely of places. This festival draws heavily from Chinese Lunar New Year celebrations in timing (following the Chinese lunar calendar), themes (clothing, food, fireworks, lanterns, red envelopes, red decorations) and even in legends (the story of Omen draws from the ancient Chinese legend of Nien). Valadar Starsong– use you lunar invitation to travel to Moonglade and speak to Valadar Starsong. The invitation is of limited duration but you can get another one from the Lunar Festival Harbinger if need be. Once in Moonglade head north up to the village of Nighthaven. Blessing of Elune – characters +40 will be offered a raid-style quest to defeat Omen (a force for good who had succumbed to the Burning Legion and was eventually defeated in Moonglade). His shade sleeps in the waters of the lake to awaken during the Lunar Festival – by firing off fireworks or attacking his wolf servants with the Elune Candles. Omen is a raid boss with 5.5 million hit points and strong attacks (cleave and star burst aoe) so that a group of players is required to defeat him. The the Blessing of Elune buff is received by walking through the light focused on Omen’s corpse and is not dependent on whether the player participated in the kill. The achievement and quest rewards (a fireworks pack, a elune lantern, some solide stone) will be obtained once the quest is finalised by handing it into to Valadar Starsong. While you can pick up this quest line up again if you have completed it in previous years it does not seem possible to hand it in (as a duplicate item is detected). Your toon will still get the hour long buff though. The first three quests give experience and/or gold proportionate to the level of the player as well as rep with Cenarion Circle. The last Quest gives an Elune stone (creates a temporary column of moonlight) as well as an Elune’s lantern with some solid stone to make more. Elder quests – each of the elders offer a quest to pay your respects. The immediate reward is a coin of ancestry (which can be spent in Moonglade to buy fireworks, moon cakes, festival clothing as well as a couple of tailoring recipes and several engineering recipes). In addition the player earns +75 rep with the 5 major cities of your faction. Some hours afterwards each Eder will send a lucky red envelope which contains either an Elune stone or a lucky rocket cluster (this gives a significant 30min health buff – but it requires a rocket launcher to use it). Coins of Ancestry Receive 1 (then 5, 10, 25 & 50) coins of ancestry (obtained by visiting the Elders). Elders of the Alliance ; Elders of the Horde; Elders of Eastern Kingdoms; Elders of Kalimdor  Elders of Northrend (18) and Elders of the Dungeons  require paying respects to all the listed Elders. For a great overview of the location of the Elders check this out. Note that it is no longer necessary to visit the Gundrak Elder (Ohanzee) on heroic as he has moved from Eck’s chamber (only accessible on Heroic mode) to behind the Drakkari Colossus. Lunar Festive Finery can easily be purchased from Valadar Starsong in Nighthaven Moonglade for 5 coins of ancestry. The rocket’s Red Glare and Frenzied Firecracker require letting off 10 fireworks within 25 & 30 secs respectively. This is either dead easy or almost impossible to achieve – depending entirely on your latency. If your latency is over 400 ms or your frame rate is low (less than 60fps) you will almost certainly have problems with this one. However there are ways around it as I discuss here. All these achievements with the exception of Elune’s Blessing are required for meta-achievement To Honor One’s Elders with the accompanying title Elder and therefore required for What a Long, Strange Trip It’s Been and the Violet proto-drake. Overall, this festival gives some experience, gold and novelty items but no highly coveted gear, pets or mounts. What it does give is the chance to explore Azeroth (as you criss-cross the three continents in search of elders); some significant boosts to the often elusive faction reputations (useful in purchasing mounts of other friendly races and, also, towards the achievements Somebody Likes Me and Ambassador of the Alliance/Horde with its accompanying title) and (since 2011) level archaelogy. And of course, it is necessary for the violet proto-drake. Perhaps after the almost blatant commercialism of the Love is in the Air event, the Lunar Festival is refreshing in its emphasis on remembering the past and honouring past ancestral heroes across factional divides. In the often fast-paced, rapidly changing, iconoclastic, individualistic, commercialised environment of our “real lives”, a reminder that the past and, dare I say it, our elders not only have value but may even have wisdom to offer us may be opportune.